This luxury ground floor apartment has absolute river frontage, overlooking the port and its fleet, and is within easy walking distance of shops, restaurants and natural attractions. It is fully self-contained with quality furniture and fittings. Accommodating up to six people in 3 bedrooms with 2 bathrooms, the apartment can also be rented as a one bedroom or two bedroom apartment with reduced tariffs. Two large queen size bedrooms have walk in robes and en-suite bathrooms making an ideal rental for couples. The third bedroom has 2 single beds. Families and groups are well suited by the 3 bedroom configuration. A large terrace area with a barbeque for outdoor living is the perfect place to dine or have evening drinks whilst overlooking the activity at the wharf. Off street car-parking in the apartment’s driveway is available for 2 cars. The apartment is situated within a five minute walk to the town centre and its wide range of quality shops and restaurants. There is also a fine dining restaurant only 100 metres away. The East Beach, South Beach and the Lighthouse are in relatively easy walking distance and by very easy vehicle access for the beaches. It is a popular destination year-round, including in the winter months as it is a cosy, spacious and well protected home-away-from-home. Clean, comfortable, well equipped and great location. Ideal and good value especially for 2 couples. Owners were helpful and friendly. Would look to stay again. 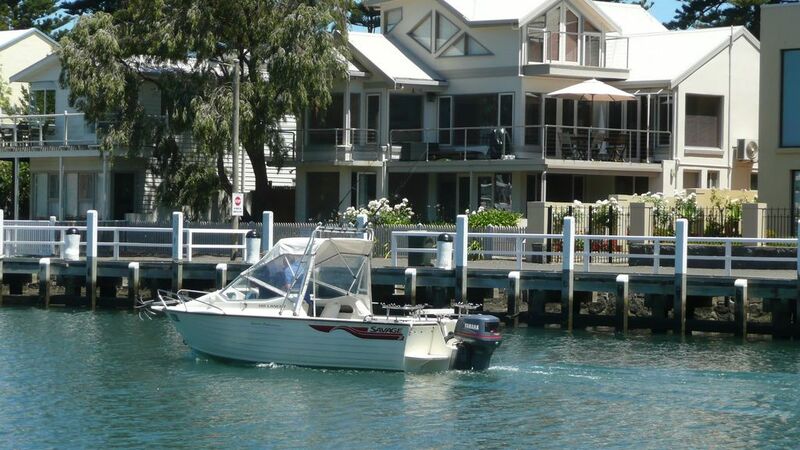 Amazing spacious accommodation with every convenience in a great location over looking the Moyne river and the boats. We've had such a blissful and relaxing stay right here on the wharf. It was my Dad's wish to return to his home town of Port Fairy, and it didn't disappoint. The home was perfect with everything we could want or need and our host was so friendly and helpful. We will definitely stsy here again in the future. Many thanks. Thank you so much. It was nice to meet you and your father and we are pleased that the return to his home town went well. We look forward to seeing you on your return at some future time. Moyne Wharf apartment was just as wonderful as on a previous visit. Spotlessly clean, so well fitted out & very comfortable. The position right on the river is just wonderful, to be able to sit outside & watch the boats coming & going, to see the seals & even a kangaroo on the board walk. The overseas visitors that were with us were just bowled over by everything. It is only a short walk to the main street & the dining & shopping options of which there are plenty. The only problem being it wasn't a long enough visit. We would not hesitate to recommend the property & would love to think that we can return at some point. Thank you Glenda. Thank you Christine. It was lovely that you were able to make a return visit with your friends and that our accommodation is on your preferred list of places to visit. We hope the rest of your trip went well. This is a beautiful house. I wish we could have stayed longer. Thank you so much for your very kind review. We would love to have you back to stay with us again in the future. We found the property to be very inviting & relatively clean but in need of a few minor items to be updated. Perhaps some new blinds & update of towels would be appreciated. We loved the location and the generous size of the apartment with its amazing views of the Moyne River. Glenda & John were very welcoming. We will definitely love to stay again in the near future and would highly recommend Moyne Wharf Apartments to our family and friends.